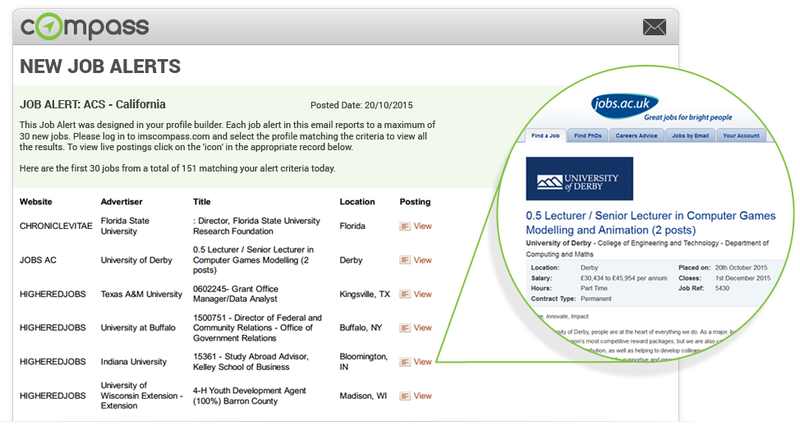 Compass Will Send You Custom Job Alerts From Every Site You Wish To Track - In One Place! Chose the conditions used to define each profile you build. A profile may have one or many conditions. Step 3: Select which boards you want the Alerts coming from as well as the frequency, Daily or Weekly. That’s it! The Alerts will be generated automatically until you suspend or delete them. You can suspend Alerts as a way to determine what works best for you without losing the work you’ve put into setting them up. See how Compass can help you find more prospects. © Copyright 2019. Compass an IMS service. All rights reserved.